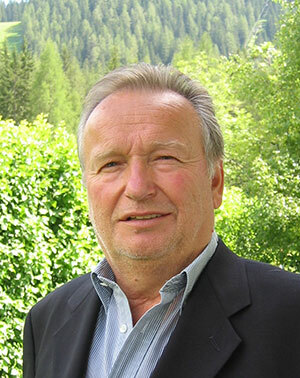 In 2015, the Bad Moos – Dolomites Spa Resort lost its founder, and the Drei Zinnen region lost a great tourism professional. Without a doubt, our boss, who was also president of the Hochpustertal tourism association for many years, enjoyed the status of a tourism pioneer. With his vision, his tireless commitment and his fighting spirit he paved the way for developments that have had a lasting impact. He combined courage, tenacity and directness with charm, intelligence and cosmopolitanism. He was always an opinion leader – a “free spirit”, as he described himself. And a bon vivant. The ambitious hotelier also set new standards in the area of spa facilities. At the end of the 1970s his hotel boasted the first sauna area in South Tyrol. He had the first jacuzzi imported from America at a time when most people hadn’t heard of them. Erwin Lanzinger was largely responsible for linking up the ski infrastructure of the Helm and Rotwand ski resorts. People have known about the therapeutic springs at Bad Moos for 350 years. There are records of people coming here to bathe since 1765 and a bath house was built around 1800. Bad Moos became even more widely known during the tourism boom in the 19th century. Sexten (Italian: Sesto) was home to several famous mountaineering families and became the starting point for lots of first ascents of Dolomite peaks. At the beginning of the 20th century, the grand spa guesthouse was offering bathing and drinking cures from three different springs. Today, only one of them is still known: the St. Valentin sulphur spring, a recognised mineral spring. In 2005, Dr Erwin Lanzinger revived the old natural spa at Hotel Bad Moos and since then the spring water has been used in a variety of ways in the hotel’s spa and health centre. The Bad Moos - Dolomites Spa Resort is one of only five hotels in South Tyrol to have an official spa cure licence. The Sexten Dolomites were a fiercely contested battleground in the First World War. Guided walks and excursions from the Bad Moos – Dolomites Spa Resort trace the history of the area. At the open-air museum of the Bellum Aquilarum association on Anderter Alpe/Bellum Aquilarum, for instance, you can see military positions from the First World War. The Bellum Aquilarum association was founded by Erwin Lanzinger and Sexten residents. It aims to document the events at the front in the Sexten Dolomites and to raise awareness of and a feeling of responsibility for the horrors of the war. The Sport & Kurhotel Bad Moos in Alta Pusteria is one of few houses in South Tyrol that possesses a curing license: the Sport & Kurhotel Bad Moos, committed to tradition, yet open to modernity. For two decades we have now been able to offer cures under medical supervision in Hotel Bad Moos. The bathing tradition in Bad Moos dates back to 1765. The bathing sources have been known since at least 1650. Around 1800 a wooden bathing house, which was later replaced by a stone construction, was built. The bathing facility was then mainly frequented by women, since this water rich in minerals was believed to stimulate fertility. At the beginning of the 20th Century, Bad Moos was an impressive bathing guest house, which offered bathing and drinking cures from three different water sources: the sulphur source, which is a recognized mineral water source today, an eye source and stomach water. Whilst the last two are no longer known, the sulphur water is still used for baths in the Sport & Kurhotel Bad Moos. This water is used in many forms for treatments in the Wellness and Health Centre "SPA BAD MOOS".